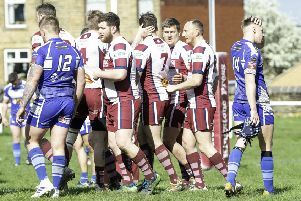 Scholes mark their return to the Bradford League top flight with a trip to Methley, who were promoted from Championship One alongside them last season, when the 2018 campaign begins on Saturday April 21. PROMOTED sides Scholes and Methley will meet on the opening day of the 2018 Allrounder Bradford Premier League season. The campaign will begin on Saturday April 21 and sees last season’s Championship One winners Scholes visit Little Church Lane in what will be Methley’s debut in the top flight. Hanging Heaton will open their Premier Division title defence at home to Cleckheaton. Hanging Heaton — who went on to win the Yorkshire Premier Leagues Championship at Headingley in September — begin with two home fixtures as Woodlands visit Bennett Lane on April 28. Woodlands pipped Farsley to the runners-up spot last season and the two sides clash on the opening day at Oakenshaw. Pudsey St Lawrence visit Bradford & Bingley in the first of three away games to start the season with as they are given additional time for their newly-relayed square to bedsdown. Last season’s top two in Championship Two, Hartshead Moor and Hunslet Nelson, meet on the opening day at Highmoor Lane in Championship One. Relegated Pudsey Congs have a challenging first match at Wrenthorpe, who just missed out on promotion to the top flight when they lost to Scholes on the final day of last season, while Batley open at home to Yeadon. One of the most interesting games in Championship Two is the clash between relegated Bowling Old Lane and last year’s Conference champions, East Ardsley. Idle’s withdrawal from the league means there are now 13 teams in the division, so there will always be one team without a game. Idle tendered their resignation from the at last month’s annual meeting at Cleckheaton after 111 years playing in the Bradford League. Idle joined in 1906 and won seven league titles and six Priestley Cups, including a hat-trick of championship wins between 1965 to 1967. League new boys Jer Lane open up their first Conference campaign with a visit to Adwalton. Premier Division: Methley v Scholes, Bradford & Bingley v Pudsey St Lawrence, Lightcliffe v New Farnley, Hanging Heaton v Cleckheaton, Woodlands v Farsley, East Bierley v Townville. Championship One: Batley v Yeadon, Hunslet Nelson v Hartshead Moor, Undercliffe v Baildon, Wrenthorpe v Pudsey Congs, Bankfoot v Gomersal, Morley v Ossett. Championship Two: Buttershaw SP v Wakefield SM, Bowling Old Lane v East Ardsley, Altofts v Spen Victoria, Northowram Fields v Birstall, Liversedge v Brighouse, Hopton Mills v Carlton, Free: Keighley. Conference: Adwalton v Jer Lane, Azaad v Rodley, Sandal v Windhill, East Leeds v Crossbank, Heckmondwike v Gildersome, Great Preston v Oulton. Premier Division: Yeadon v Batley, Pudsey St Lawrence v Bowling Old Lane, New Farnley v Lightcliffe, Pudsey Congs v Hanging Heaton, Gomersal v Woodlands, Ossett v East Bierley. Championship One: Wakefield St Michaels v Methley, East Ardsley v Bradford & Bingley, Baildon v Undercliffe, Cleckheaton v Wrenthorpe, Farsley v Bankfoot, Carlton v Morley. Championship Two: Scholes v Great Preston, Hartshead Moor v Azaad, Townville v Hopton Mills, Spen Victoria v Altofts, Brighouse v Liversedge, Birstall v Northowram Fields, Free: Keighley. Conference: Jer Lane v Adwalton, Rodley v Hunslet Nelson, Windhill v Sandal, Crossbank Meths v East Leeds, Gildersome v Heckmondwike, Oulton v Buttershaw St Paul’s.